For the Australian rules footballer, see Brian Waters (footballer). Waters at the 2009 Pro Bowl. Brian Demond Waters (born February 18, 1977) is a former American football guard. He was signed by the Dallas Cowboys as an undrafted free agent in 1999 out of the University of North Texas. He has also played for the Kansas City Chiefs and New England Patriots, and earned six Pro Bowl selections during his career. Waters was born in Waxahachie, Texas, and attended Waxahachie High School. He lettered in football. As a senior, he was an All-District honoree as both a tight end and defensive end. He made 16 receptions for 380 yards on offense, and made five sacks and 66 tackles on defense. Waters attended the University of North Texas where he played for the North Texas Mean Green football team. He started his first three years at tight end, while recording 86 receptions for 975 yards and nine touchdowns. As a senior he was moved to defensive end, but also played as a backup fullback and tight end. On defense he had 45 tackles (32 solo) and 5 sacks. The Dallas Cowboys signed him as an undrafted free agent after the 1999 NFL draft to play tight end and fullback. He was released during training camp. 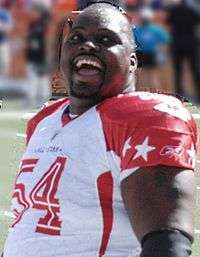 The Kansas City Chiefs signed him as a free agent during the 2000 offseason and sent him to play with the Berlin Thunder in NFL Europe, with the plan of converting him to center. Waters was named an All-Pro twice and was selected to the Pro Bowl five times in his eleven-year career with the Kansas City Chiefs. In 2003, he was a part of a 13-3 Chiefs team. During the 2004 season, Waters was selected as the AFC Offensive Player of the Week for his play during a game against the Atlanta Falcons on October 24, 2004. The Chiefs scored an NFL-record eight rushing touchdowns during that game. Waters is the only offensive lineman in the AFC to have received the award, and the only lineman in the NFL to win since 1992. Waters was recognized as the recipient of the 2009 Walter Payton Man of the Year Award which honors a player's contribution on the field as well as off. After 11 seasons in Kansas City, he was released on July 28, 2011. On September 4, 2011, Waters signed with the New England Patriots. Waters, who started every game at right guard for the Patriots, was voted a starter for the Pro Bowl. After never having won a playoff game before the 2011 season, Waters played for the Patriots in Super Bowl XLVI. Prior to the start of the 2012 season, Waters refused to report to the Patriots. Waters said that if he were to play in 2012, it would be for a team close to his family in Texas. The Patriots finally released Waters from his contract on April 30, 2013. The Dallas Cowboys signed Waters to a one-year contract worth $3 million on September 3, 2013. Waters announced his retirement on September 2, 2014. ↑ "Waxahachie, Texas". City-Data.com. Retrieved 5 June 2014. ↑ "Report: Patriots Sign Guard Brian Waters". CBS. September 4, 2011. Retrieved 2012-02-05. ↑ Forsberg, Chris (January 11, 2012). "Waters wants taste of postseason success". ESPN.com. Retrieved 2012-02-05. 1 2 "Patriots - Chiefs: Weekend Scout Report". Scout.com. November 22, 2004. Retrieved 2012-02-05. ↑ "Chiefs Look to Boss Colts". sportinglife.com. October 28, 2004. Retrieved 2012-02-05. ↑ Cluff, Chris (October 31, 2004). "Notebook: Chargers' Chatman has people talking". Seattle Times. Retrieved 2012-02-05. ↑ "Wilson: Brian Waters named NFL Man of the Year". National Football Post. Retrieved 2011-10-22. ↑ "news: Patriots agree to terms with veteran Pro Bowl G Waters". Nfl.com. Retrieved 2011-10-22. ↑ Rosenthal, Gregg (2013-04-30). "Brian Waters released by New England Patriots". National Football League. Retrieved 2013-04-30. ↑ Rosenthal, Gregg (2014-09-02). "Brian Waters retires after 13 seasons in NFL". National Football League. Retrieved 2014-09-02.